York Factory, Hudson's Bay, September 1, 1854. I HAVE the honour to report for the information of the Governor, Deputy Governor, and Committee, that I arrived here yesterday with my party all in good health, but, from causes which will be explained in their proper place, without having effected the object of the expedition. 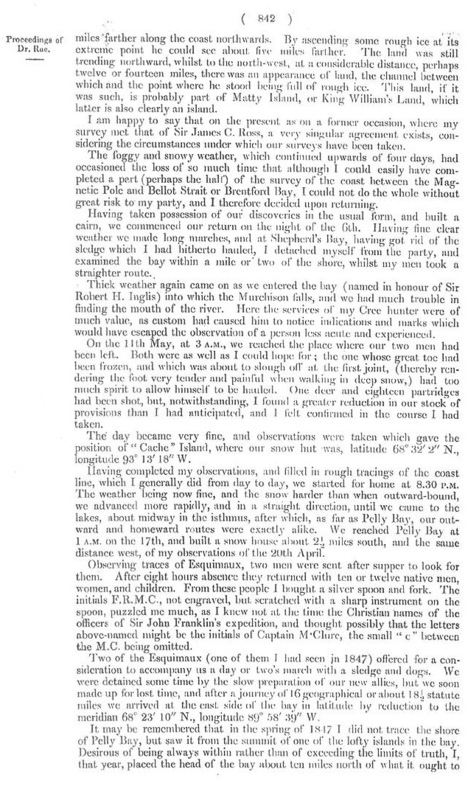 At the same time information has been obtained and articles purchased from the natives, which prove beyond a doubt that a portion, if not all, of the then survivors of the long-lost and unfortunate party under Sir John Franklin had met with a fate as melancholy and dreadful as it is possible to imagine. 20th April. The fresh footmarks of an Esquimaux with a sledge having been seen yesterday on the ice within a short distance of our resting place, the interpreter and one man were sent to look for them, the other two being employed in hunting and collecting fuel, whilst I obtained excellent observations, the results of which were- latitude 68˚ 29' 28" N., longitude by chronometer 90˚ 18' 32" W., variation of compass 98˚ 30' W. The latter is apparently erroneous, probably caused by much local attraction. After an absence of eleven hours the men sent in search of Esquimaux returned in company with seventeen natives (five of whom were women), and several of them had been at Repulse Bay when I was there in 1847. Most of the others had never before seen "whites," and were extremely forward and troublesome. They would give us no information on which any reliance could be placed, and none of them would consent to accompany us for a day or two, although I promised to reward them liberally. Apparently there was a great objection to our travelling across the country in a westerly direction. Finding it was their object to puzzle the interpreter, and mislead us, I declined purchasing more than a piece of seal from them, and sent them away, not, however, without some difficulty, as they lingered about with the hope of stealing something, and, not withstanding our vigilance, succeeded in abstracting from one of the sledges a few pounds of biscuit and grease. The morning of the 21st was extremely fine, and at 3 A.M. we started across land towards a very conspicuous hill bearing west of us. On a rocky eminence some miles inland we made a "cache" of the seal's flesh we had purchased. Whilst doing this our interpreter made an attempt to join his countrymen ; fortunately his absence was observed before he had gone back very far, and he was overtaken after a sharp race of four or five miles. He was in a great fright when we came up to him, and was crying like a child, but expressed his readiness to return, and pleaded sickness as an excuse for his conduct. I believe he was really unwell, probably from having eaten too much boiled seal's flesh, with which he had been regaled at the snow huts of the natives. Having taken some of the lading off Ouligbuck's sledge, we had barely resumed our journey when we were met by a very intelligent Esquimaux driving a dog's sledge laden with musk ox beef. This man at once consented to accompany us two days journey, and in a few minutes had deposited his load on the snow, and was ready to join us. Having explained my object to him, he said that the road by which he had come was the best for us, and, having lightened the men's sledges, we travelled with more facility. We were now joined by another of the natives who had been absent, seal hunting yesterday, but being anxious to see us had visited our snow house early this morning, and then followed up our track. This man was very communicative, and on putting to him the usual questions as to his having seen "white men" before, or any ships or boats, he replied in the negative, but said that a party of "Kabloonans" had died of starvation a long distance to the west of where we then were, and beyond a large river. He stated that he did not know the exact place, that he never had been there, and that he could not accompany us so far. In the spring, four winters past (1850), whilst some Esquimaux families were killing seals near the north shore of a large island, named in Arrowsmith's charts, King William's Land, about forty white men were seen travelling in company southward over the ice, and dragging a boat and sledges with them. They were passing along the west shore of the above-named island. None of the party could speak the Esquimaux language so well as to be understood, but by signs the natives were led to believe the ship or ships had been crushed by ice, and that they were then going to where they expected to find deer to shoot. From the appearance of the men (all of whom, with the exception of one officer, were hauling on the drag ropes of a sledge, and were looking thin,) they were then supposed to be getting short of provisions, and they purchased a small seal or piece of seal from the natives. The officer was described as being a tall stout middle-aged man. When their day's journey terminated they pitched tents to rest in. At a later date the same season, but previous to the disruption of the ice, the corpses of some thirty persons and some graves were discovered on the continent, and five dead bodies on an island near it, about a long day's journey to the north-west of the mouth of a large stream, which can be no other than Back's Great Fish River (named by the Esquimaux Oot-koo-hi-ca-lik), as its description and that of the low shore in the neighbourhood of Point Ogle and Montreal Island agree exactly with that of Sir George Back. Some of the bodies were in a tent or tents, others were under the boat, which had been turned over to form a shelter, and some lay scattered about in different directions. Of those seen on the island it was supposed that one was that of an officer (chief), as he had a telescope strapped over his shoulders, and his double-barrelled gun lay underneath him. From the mutilated state of many of the bodies, and the contents of the kettles, it is evident that our wretched countrymen had been driven to the last dread alternative as a means of sustaining life. A few of the unfortunate men must have survived until the arrival of the wild fowl (say until the end of May), as shots were heard and fresh bones and feathers of geese were noticed near the scene of the sad event. There appears to have been an abundant store of ammunition, as the gunpowder was emptied by the natives in a heap on the ground out of the kegs or cases containing it, and a quantity of shot and ball was found below high-water mark, having probably been left on the ice close to the beach before the spring thaw commenced. 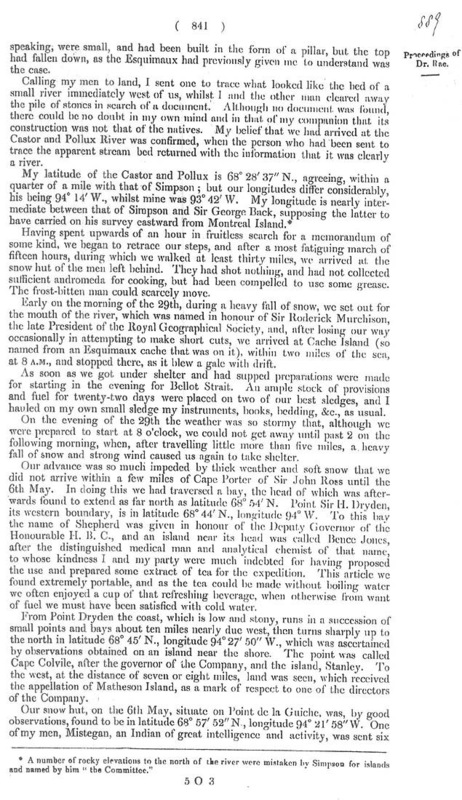 There must have been a number of telescopes, guns (several of them double-barrelled), watches, compasses, &c., all of which seem to have been broken up, as I saw pieces of these different articles with the natives, and I purchased as many as possible, together with some silver spoons and forks, an order of merit in the form of a star, and a small silver plate engraved Sir John Franklin, K.C.H. 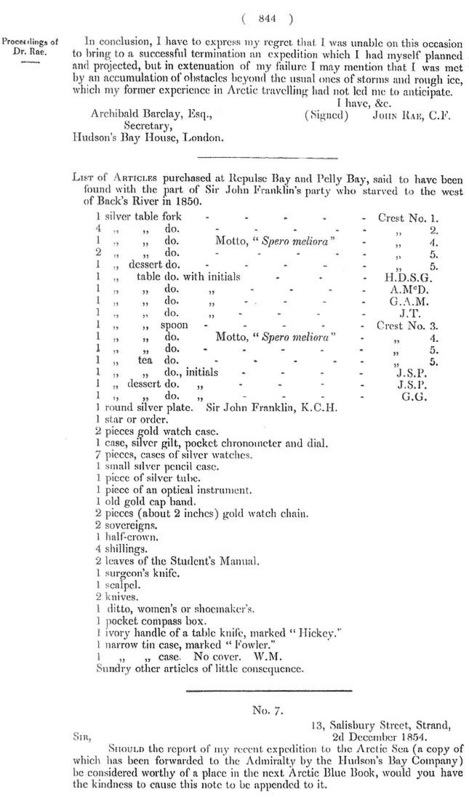 Enclosed is a list of the principal articles bought, with a note of the initials, and a rough pen-and-ink sketch of the crests on the forks and spoons. The articles themselves I shall have the honour of handing over to you on my arrival in London. None of the Esquimaux with whom I had communication saw the "white men" either when living or after death, nor had they ever been at the place where the corpses were found, but had their information from natives who had been there, and who had seen the party when travelling over the ice. From what I could learn there is no reason to suspect any violence had been offered to the sufferers by the natives. As the dogs in the sledge were fatigued before they joined us, our day's journey was a short one. Our snow house was built in latitude 68˚ 29' N. and longitude 90˚ 42' 42" W. on the bed of a river having high mud banks, and which falls into the west side of Pelly Bay about latitude 68˚ 47' N. and longitude 90˚ 25' W.
On the 22d we travelled along the north bank of the river (which I named after Captain Beecher of the Admiralty) in a westerly direction for seven or eight miles, until abreast of a lofty and peculiarly shaped hill, already alluded to, and which I named Ellice Mountain, when we turned more to the northward. We soon arrived at a long narrow lake, on which we encamped, a few miles from its east end, our day's march being little more than thirteen miles. Our Esquimaux auxiliaries were now anxious to return, being in dread, or professing to be so, that the wolves or wolverines would find their "cache" of meat and destroy it. Having paid them liberally for their aid and information, and having bade them a most friendly farewell, they set out for home as we were preparing for bed. 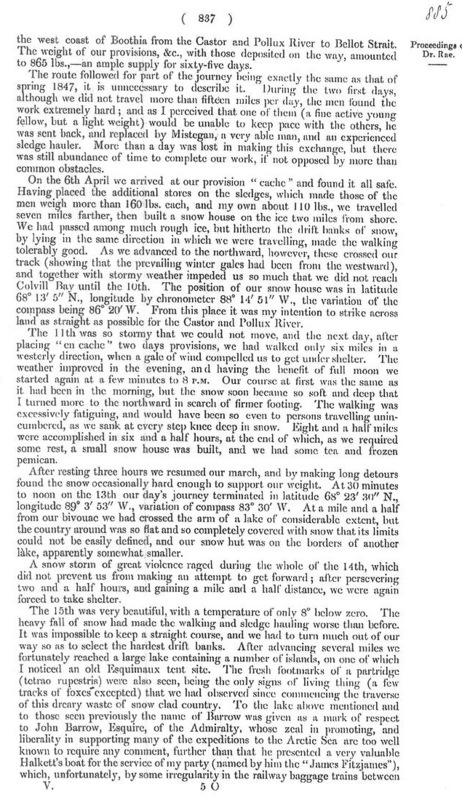 Our snow hut, on the 6th May, situate on Point de la Guiche, was by good observations, found to be in latitude 68˚ 57' 52" N., longitude 94˚ 21' 58" W. One of my men, Mistegan, an Indian of great intelligence and activity, was sent six miles farther along the coast northwards. By ascending some rough ice at its extreme point he could see about five miles farther. The land was still trending northward, whilst to the north-west, at a considerable distance, perhaps twelve or fourteen miles, there was an appearance of land, the channel between which and the point where he stood being full of rough ice. This land, if it was such, is probably part of Matty Island, or King William's Land, which latter is also clearly an island. The width of the isthmus separating Pelly and Shepherd Bays is fully sixty geographical miles. In the evening, before parting with our Esquimaux assistants, we bought a dog from them, and after a most friendly farewell resumed our journey eastward, and found on a long lake some old snow house, in which we took up our lodgings. 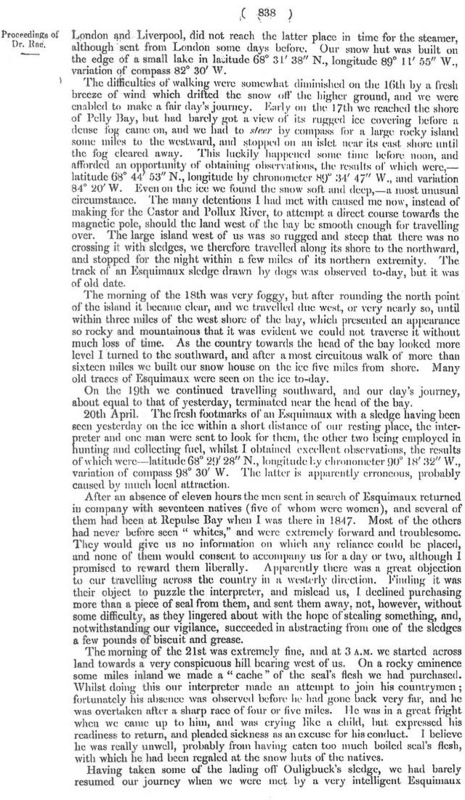 Here a set of good observations placed us in latitude 68˚ 12' 18" N., longitude 89˚ 24' 51" W., variation 81˚ W.
On the morning of the 21st we arrived at Committee Bay, from thence our route to Repulse Bay was almost the same as before, and I shall not therefore advert to it farther than to mention that we arrived at our winter home at 5 A.M. on the 26th May, having, from the better walking, travelled in twenty days the distance (less forty or fifty miles) which had taken us thirty-six days to accomplish on our outward journey. It was from this time until August that I had opportunities of questioning the Esquimaux regarding the information which I had already obtained of the party of whites who had perished of starvation, and of eliciting the particulars connected with that sad event, the substance of which I have already stated. In the early part of July the salmon came from the sea to the mouths of the rivers and brooks which were at that date open, and we caught numbers of them, so that occasionally we could afford to supply our native friends with fifty or one hundred in a night. As is the usual custom at the Hudson's Bay Company's inland trading posts, all provisions were given gratis, and they were much more gratefully received by the Esquimaux than by the more southerly and more favoured red man. We had still on hand half of our three months stock of pemican [sic] and a sufficiency of ammunition to provide for the wants of another winter. We were all in excellent health, and could get as many dogs as we required, so that (D.V.) 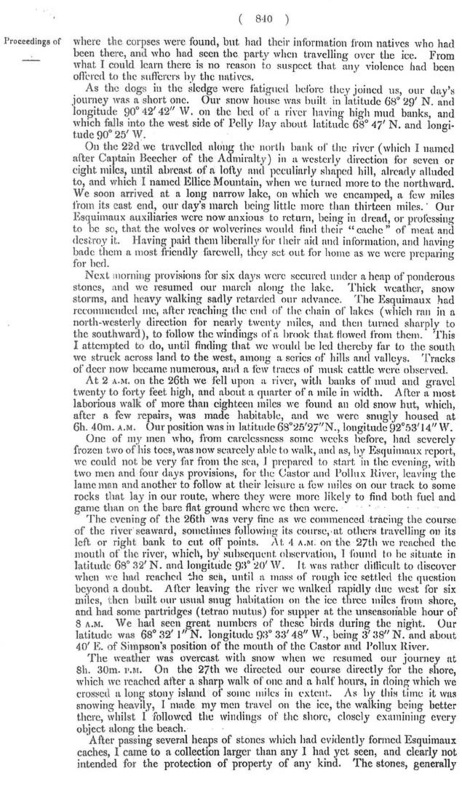 there was little doubt that a second attempt to complete the survey would be successful ; but I now thought that I had a higher duty to attend to, that duty being to communicate with as little loss of time as possible the melancholy tidings which I had heard, and thereby save the risk of more valuable lives being jeopardized in a fruitless search in a direction there was not the slightest prospect of obtaining any information. I trust this will be deemed a sufficiently good reason for my return. 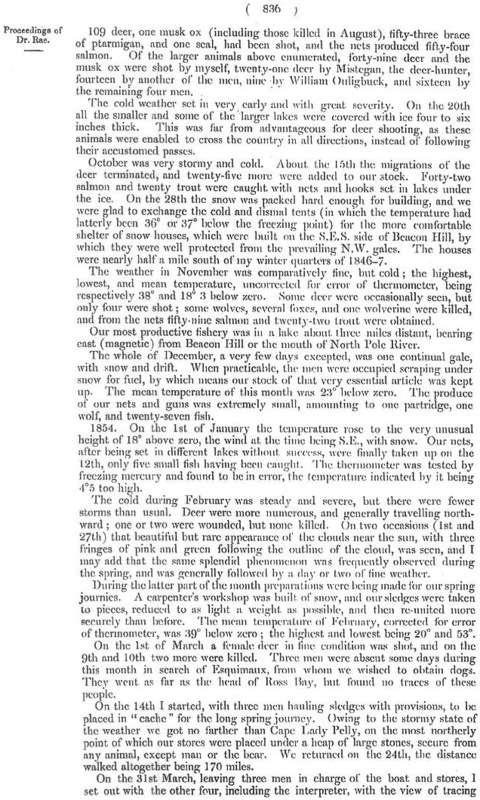 The summer was extremely cold and backward ; we could not leave Repulse Bay until the 4th of August, and on the 6th had much difficulty in rounding Cape Hope. From thence as far as Cape Fullerton the strait between Southampton Island and the main shore was fully packed with ice, which gave us great trouble. South of Cape Fullerton we got into open water. 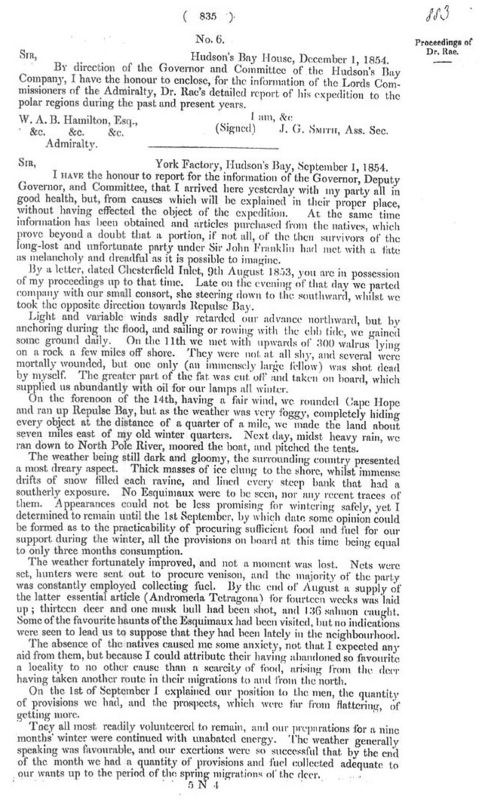 On the evening of the 19th calms and head winds much retarded us, so that we did not enter Churchill River until the morning of the 28th August ; there we were detained all day by a storm of wind. My good interpreter, Wm. Ouligbuck, was landed, and before bidding him farewell I presented him with a very handsomely mounted hunting knife intrusted to me by Captain Sir George Back for his former travelling companion, Ouligbuck, but as the old man was dead I took the liberty of giving it to his son as an inducement to future good conduct, should his services be again required. A three days run brought us to York factory, at which place we landed all well on the forenoon of the 31st August. 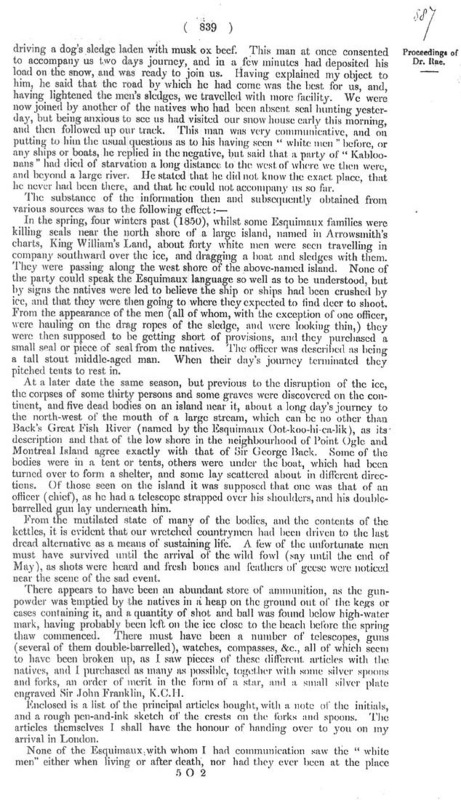 I am happy to say that the conduct of my men, under circumstances often very trying, was, generally speaking, extremely good and praiseworthy ; and although their wages were higher than those of any party who have hitherto been employed on boat expeditions, I thought it advisable, after consulting with chief factor William Mactavish, to give each a small gratuity, varying the amount according to merit. In conclusion, I have to express my regret that I was unable on this occasion to bring to a successful termination an expedition which I had myself planned and projected, but in extenuation of my failure I may mention that I was met by an accumulation of obstacles beyond the usual ones of storms and rough ice, which my former experience in Arctic travelling had not led me to anticipate. 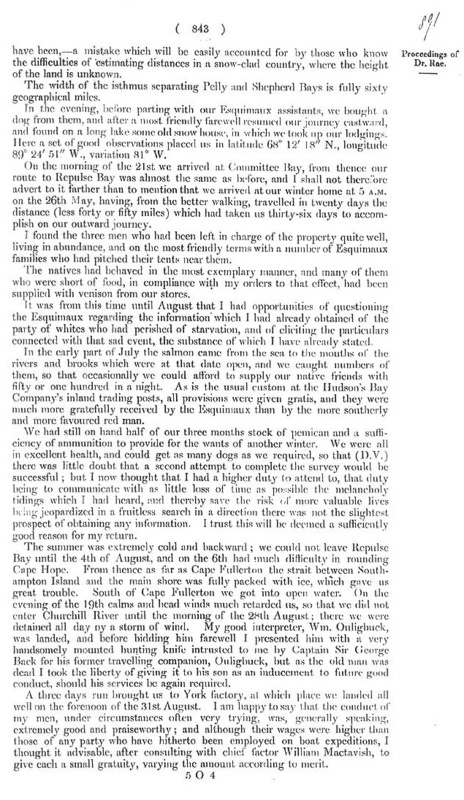 LIST of ARTICLES purchased at Repulse Bay and Pelly Bay, said to have been found with the part of Sir John Franklin's party who starved to the west of Back's River in 1850. 1 silver table fork - - - - - Crest No. 1. 4 " " do. - - - - - " 2. 1 " " do. Motto, "Spero meliora" - " 4. 2 " " do. - - - - - " 5. 1 " dessert do. - - - - - " 5. 1 " table do. with intials - - - H.D.S.G. 1 " " do. " - - - - A. McD. 1 " " do. " - - - - G.A.M. 1 " " do. " - - - - J.T. 1 " " spoon - - - - - Crest No. 3. 1 " " do. - - - - - " 5. 1 " tea do. - - - - - " 5. 1 " " do., initials - - - - J.S.P. 1 dessert do. " - - - - J.S.P. 1 " " do. " - - - - G.G. 1 round silver plate. Sir John Franklin, K.C.H. 2 pieces gold watch case. 1 case, silver gilt, pocket chronometer and dial. 7 pieces, cases of silver watches. 1 small silver pencil case. 1 piece of silver tube. 1 piece of an optical instrument. 1 old gold cap band. 2 pieces (about 2 inches) gold watch chain. 2 leaves of the Student's Manual. 1 ditto, women's or shoemaker's. 1 ivory handle of a table knife, marked "Hickey." 1 narrow tin case, marked "Fowler." 1 " " case. No cover. W.M. Sundry other articles of little consequence.